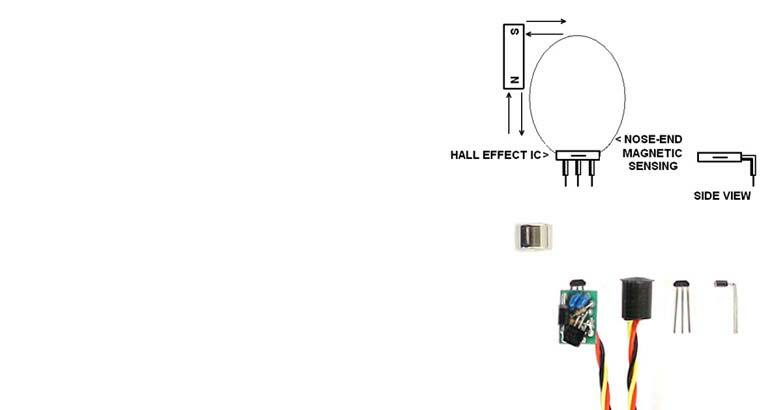 For virtually infinite operational life, Hall Effect IC's and Magneto-resistance (MR) IC's offer compact sensor size and large sensing air-gaps when actuated by discrete permanent magnets (but for actuating by steel, see our other web site pages for our range of "proximity sensors"). We also have select and appropriate actuator magnets in our molded or machined housings. These sensors usually output up to 20 milli-Amperes for logic-signal loads but these can be modified with output buffer circuits to be capable of power load switching. We often provide internal pull-up resistors for the output which is usually of the NPN sinking type, through modifications can provide PNP output. Precision power supplies are not needed and most sensors will accept supply from 4 to 28VDC. Uniquely, we offer RAPID PRODUCTION TOOLING to supply molded CUSTOM HOUSINGS OFTEN IN SEVERAL DAYS and these are production intent-molded parts. TOOLING IS USUALLY NO-CHARGE FOR NEW CUSTOMERS.